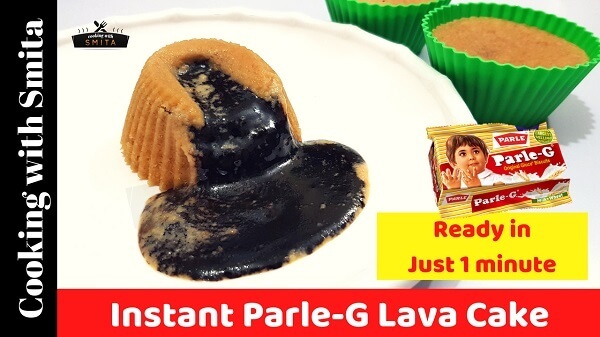 Today I’m sharing an Instant Parle G Lava Cake – a delicious & easiest cupcake recipe made from the most popular Parle G Biscuit. You can surprise your friends, guests or loved ones by making this cake in just 1 minute! That’s right; it takes only 1 minute in the microwave to bake this yummy cupcake. 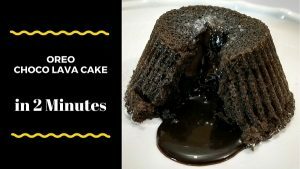 To prepare the exact lava cake, follow the chocolate ball recipe shared here and make a perfect Parle G Lava cake as shown in video recipe below. Break Parle G biscuits roughly and add in a mixer/blender jar and grind to fine powder. Add the biscuit powder Into a mixing bowl, add sugar (optional) baking soda and baking powder, mix well. Now, add Milk and melted Butter. At this stage, you can also add 1 tsp. Cocoa Powder. Mix well all the ingredients & prepare the batter. Pour some batter (fill 1/4th) into silicon mould and then add a chocolate ball in each cupcake mould. Pour the batter over the chocolate ball and fill the 3/4th mould. Bake in the microwave for just 45 seconds to 1 minute, depending on the microwave temperature. Place the cupcake mould in a plate upside down and pull up the mould. In a microwave-safe bowl, add chocolate compound, water and Oil. Melt chocolate in the microwave for 1 minute, take out and mix well using a spoon until smooth. There are 2 methods to make chocolate balls. Grease ice cube tray with coconut oil and pour the mixture into the ice tray. Freeze in the refrigerator for 2 – 3 hours. Instead of cooling down the chocolate mixture to room temperature, keep it directly in the refrigerator for 30 minutes. After 30 minutes, take out from the refrigerator and prepare small size chocolate balls from the mixture and keep in the freezer for 2 hours. You can use these chocolate balls in all Lava Cake recipes I’ve shared.